YOU'VE COMPLETED THE JUMPSTART TRAINING. NOW KEEP THE MOMENTUM GOING. The lessons and techniques I’ve curated in the Legacy Collection are the result of decades of experience as a martial arts instructor, entrepreneur, business coach, and world traveler. This is the stuff I wish I’d had when I first started on my journey to self-mastery and entrepreneurship. Now I’m offering it to you, so you can undergo serious life improvements faster and easier. For a limited time, in recognition of our amazing community and our current Upgraded Life Tour, all 9 of my premium personal and professional development trainings are together in one package. You won’t want to miss this unbelievable offer – once it’s gone, it’s gone forever. NOW IT'S TIME TO MAKE SURE YOU NEVER FORGET. Hundreds of thousands of people around the world have seen massive improvements in their personal and professional lives thanks to the timeless and powerful trainings in the Complete Legacy Collection. Whether you’re looking to elevate your energy, build better relationships, grow your wealth, or simply live a happier and more fulfilling life, there’s something for everyone. This is self-improvement on a deep level, with specific and practical steps to really get what you want out of life. Every project requires the right tools to be successful – so the project of your Life deserves nothing less than the very best. You deserve to be happy, simply because you can. You deserve to love the life you create for yourself because it’s the only one you’ve got. There’s no reason to hold back any longer out of fear of failure or judgement. The life you want is waiting for you to step up and claim it. So if you’re tired of just “getting by” or if you’re ready to upgrade swiftly in substantial ways, the Complete Legacy Collection is for you. And at this price, it won’t be available for very long. Is Abundant Wealth in Your Future? "Did a training for acupuncturists this past weekend and implemented what I have learned in your trainings. The Results? 27 acups showed up for a 2 day training @ $2,000 each = $54K. Product sales (first time selling products) $4,600 for books and eye drops. Upsell (first upsell) for my advanced training - 9 paid $3000 = $27K. Total paid this weekend was $87K! Two students came up at the end of the training and said 'How much to learn everything from you? Just tell me and I will cut a check.' Thank you for this experience. Much love and appreciation!" My 4-Phase Meditation Framework. It’s designed to help you stay in alignment with your Purpose and help you “pre-pave” the achievement of your goals and the arrival of your desires adding predictability to your creations. My twelve personal “rituals” created for getting clear (and staying clear) on your life’s Purpose, finding a PATH that will lead you toward the greatest expression of that Purpose, and developing a PLAN for following your Path even if you’ve tried before and failed. Journaling is the link between your conscious, subconscious and “The Superconscious.” Failure to understand and use this connection with intention causes massive suffering. The Journal Secrets program not only guides you step by step through the exact system I use for manifestation, health, energy, creativity and just good old fashioned luck. My Flagship personal mastery program for shifting your beliefs, moving through your Fears, and developing a mental framework that is in alignment with your Values, Goals, and ultimate Vision for your Life regardless of your past history. You’ll find yourself quickly and easily taking the actions everyday that add up to real life financial improvements… This can happen so fast, you may wonder where the money was all this time. Discover the lifestyle of ultimate purpose and freedom that awaits you. This life is yours once you discover how to be rewarded for your unique experience and perspective. The premier system for building a personally branded, message-driven information business — this is the exact model that I use to create and enroll students in every single course I’ve listed here. You get my Strategic “6 Message Strategy” for social media that pulls in sales, course creation using my C.A.S.T. system, plus introduction and training on the four gate instant close for high-value sales. My personal systems and practices for managing a business from client/customer acquisition, value creation, strategies for continuous growth, and most importantly, the total protection of your time freedom. A Previously Unreleased BONUS training that accompanied a live event. Think of this as the ECB “Expansion Pack.” Discover how you share your expertise and develop a multi 5 or 6 figure per month business using only your smartphone…even if you’re not a techie kind of person. This Collection is $9,393.00 worth of trainings, yours now at a fraction of the original cost. You have already completed the hardest part. A new life of alignment, focused confidence and effortless receiving is ready for you. The Collection provides you with a powerful set of elegant tools to use for life, keeping your frequency and vibration high so that you stay drama free and in the Creator’s Zone. This limited invitation is available to you now…but I can’t guarantee how long we’ll keep this open. So I want to make this simple for you. If you trust me… and more importantly, if you trust yourself to stay at the level of confidence and clarity you have experienced in the Jumpstart training… this entire library for personal and professional growth is available for less than 10% of the original price. How Much Is It Costing To NOT Share Your Existing Wisdom? "62 days ago, I started paying attention to and studying 360 Mentor Academy training. 60 days ago, I incorporated a business. In the last 56 days, I have taken in over $32,000 in revenue, and I have done this with a very small handful of clients. I have seen and will see somewhere in the order of 100X on the cost of 360 Mentor Academy. And I'm only getting started. Jesse, I can't tell you how much I appreciate you." Success becomes inevitable when you have the right tribe for you. Between Jesse’s weekly “Sunday Sermon,” Q&A livestreams, group accountability calls and firsthand access to new trainings, you’ll receive consistent level-ups during your journey. 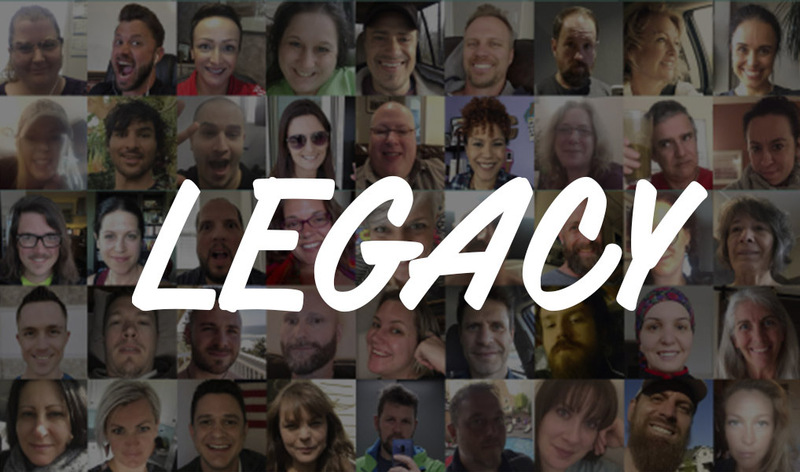 As a Legacy member, you receive exclusive discounts on new course content and live events, including the next Legacy Live event and upcoming Upgraded Life Tour. BUT THIS OFFER WILL DISAPPEAR SOON. My private clients tell me the price is WAY too low in proportion to the value (normally I charge $15K per day for private training). But I’m a big believer in making self-mastery and self-improvement a journey everyone can enjoy. This is timeless material that applies no matter who you are or where you’re at in life. Consider how much your life could improve by applying just ONE of these courses. This is the only time I’m offering all of my course content AND Legacy membership in one package at this price. You might be wondering why I’m making all this so affordable compared to the value of this collection. I remember what it was like to be starting a new journey. Even though I knew a lot, there was a lot I didn’t know, and that lack of knowledge was paralyzing. As I was learning, growing and watching my life become the very thing I’d dreamed about, I made myself a promise. If I ever shared what I’d learned… It would be available to anyone who was committed. That’s the same thing my instructors expected of me, and it is what I expect of anyone I work with. You have proven your commitment by completing the Jumpstart training. This is the final step to enter a new reality, by obtaining the tools and treasure trove of a lifetime’s experience from someone who has accomplished real results. And if you would like to take the next steps together, then I invite you to become an owner of the Collection. "I am SOOO excited. Everything you are teaching, Jesse, resonates deeply with me. You have brought together ideas I've been exploring, and gathering, for many years. NOW it is becoming clear and PRACTICAL. Thank you so much. I APPRECIATE that YOU and the Legacy Community have come into my life. PERFECT timing. OF COURSE!" "Landed a $10,000/month deal this week, which is great, but I'm even more stoked about all our other business and life developments like 2 weeks in Tulum coming up and 4 days of 5 star hotel madness in NYC this summer. Those are great results, but it's even better to have this new mind space based on the legacy training. I'm unfuckwithable 90% of the time now." How will I gain access to the content? Once your order is complete, we will send you an email with login access to all of the training so you’ll be able to start the upgrades right away! You’ll have your own personal and private access to the online, virtual classroom that you can go to any time. Each training is different. They are as long as they need to be to give you the very best, world class training that produces real and measurable results. You can start and stop at your own pace. It’s not a sprint. You’ll start seeing results immediately and we recommend you focus on the area most important to you. Can I continue as a Legacy member after 3 months? Yes! Legacy membership is available to you at the locked-in rate of $297 per quarter. Meanwhile, all the courses in this collection are yours to keep for life. If after going through any one of the programs, you don’t feel that the investment you’ve made in yourself was totally worth it, please let us know and we will cheerfully return your money. For 100% of the students. However… I understand your priorities may shift. Sometimes old habits creep back in and you get comfortable. Or maybe you decide that you just don’t want to do what it takes, and there’s truly nothing wrong with that. Let’s face it. Turning dreams into reality is easy, once you know how. But we live in a world where it seems crazy to think and live this way. So I want you to have an “escape hatch” where you can bail out of this exhilarating ride anytime it gets too good for your upper limits to handle. It’s really easy. We offer a 100% unconditional money back guarantee. After 90 days of watching the videos and acting upon the small, daily steps you’ll learn, if you haven’t seen the improvements that you desire, just email [email protected] with the phrase “Jesse, I’m going my own way” in the subject line and we’ll swiftly refund your investment, no questions asked.